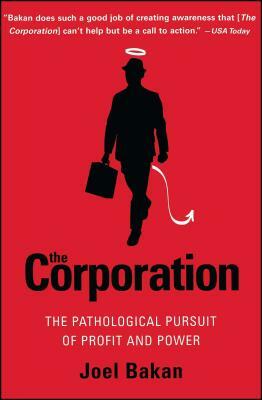 The inspiration for the film that won the 2004 Sundance Film Festival Audience Award for Best Documentary, The Corporation contends that the corporation is created by law to function much like a psychopathic personality, whose destructive behavior, if unchecked, leads to scandal and ruin. Over the last 150 years the corporation has risen from relative obscurity to become the world's dominant economic institution. Eminent Canadian law professor and legal theorist Joel Bakan contends that today's corporation is a pathological institution, a dangerous possessor of the great power it wields over people and societies. -The corporation's legally defined mandate is to pursue relentlessly and without exception its own economic self-interest, regardless of the harmful consequences it might cause to others. -The corporation's unbridled self-interest victimizes individuals, society, and, when it goes awry, even shareholders and can cause corporations to self-destruct, as recent Wall Street scandals reveal. -Governments have freed the corporation, despite its flawed character, from legal constraints through deregulation and granted it ever greater authority over society through privatization. "Bakan does such a good job of creating awareness that [The Corporation] can't help but be a call to action." "The corporation, according to Joel Bakan, is the monster that can swallow civilization -- greedy, exploitive, and unstoppable. We are all its potential victims, which is why we must all understand how the corporate form makes it so difficult to control its abuses." "This incisive study should be read carefully and pondered. And it should be a stimulus to constructive action."